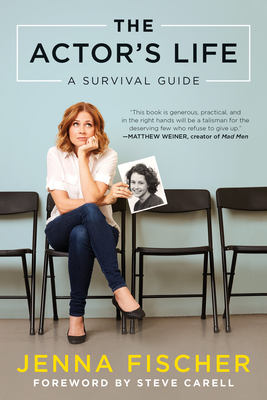 The Actor's Life: A Survival Guide (Paperback) | The Drama Book Shop, Inc.
Jenna Fischer's Hollywood journey began at the age of 22 when she moved to Los Angeles from her hometown of St. Louis. With a theater degree in hand, she was determined, she was confident, she was ready to work hard. So, what could go wrong? Uh, basically everything. The path to being a professional actor was so much more vast and competitive than she'd imagined. It would be eight long years before she landed her iconic role on The Office, nearly a decade of frustration, struggle, rejection and doubt. If only she'd had a handbook for the aspiring actor. Or, better yet, someone to show her the way--an established actor who could educate her about the business, manage her expectations, and reassure her in those moments of despair. Jenna wants to be that person for you. With amusing candor and wit, Fischer spells out the nuts and bolts of getting established in the profession, based on her own memorable and hilarious experiences. She tells you how to get the right headshot, what to look for in representation, and the importance of joining forces with other like-minded artists and creating your own work--invaluable advice personally acquired from her many years of struggle. She provides helpful hints on how to be gutsy and take risks, the tricks to good auditioning and callbacks, and how not to fall for certain scams (auditions in a guy's apartment are probably not legit--or at least not for the kind of part you're looking for ). Her inspiring, helpful guidance feels like a trusted friend who's made the journey, and has now returned to walk beside you, pointing out the pitfalls as you blaze your own path towards the life of a professional actor. Jenna Fischer is best known for playing Pam Beesly for nine seasons on the acclaimed television show The Office, for which she received an Emmy nomination for Best Supporting Actress and two SAG Awards for Outstanding Performance by an Ensemble Comedy. After wrapping The Office, Fischer went on to star in the Off-Broadway play Reasons to Be Happy, written and directed by Neil LaBute and co-starring Josh Hamilton, Leslie Bibb, and Fred Weller. Most recently, Fischer starred along with Rob Lowe and Megan Mullally in the NBC limited series You, Me, and the Apocalypse. She also had a recurring role on NBC's Mysteries of Laura and made guest star appearances on Fox's The Grinder and Comedy Central's Drunk History. Fischer's films credits include The Giant Mechanical Man (which she also produced), The Farrelly Brothers' comedy Hall Pass, Solitary Man, opposite Michael Douglas, Walk Hard: The Dewey Cox Story, produced by Judd Apatow, The Promotion, Matt Weiner's Are You Here, and Blades of Glory opposite Will Ferrell. In 2004, the Screen Actors Guild awarded Fischer with the Emerging Actor Award at the St. Louis Film Festival. She lives in Los Angeles with her family.